Despite using coconut water, milk, meat and oil in many of my recipes, I have a love/hate relationship with coconut. My love affair with coconut began as a toddler when a nice Mexican man gave me a hunk of fresh coconut meat to teethe on during my parents’ vacation in Acapulco. I have lovingly done the same for my daughter. Coconut is incredibly nutritious. It is unusually high in trace minerals and healthy, medium-chain fatty acids, like lauric acid (found otherwise only in human breast milk) and caprylic acid (a potent natural antiviral and antifungal). Coconut oil can help reduce both your cholesterol ratio and your waistline. And if that weren’t enough, the water in a coconut has the same mineral and electrolyte profile as human blood plasma! However, coconuts, like most tropical fruits eaten by Westerners, have a big, heavy transportation footprint. In most of the continental U.S., coconuts are not a local food. In fact, most coconuts are shipped thousands of miles from South America and Asia, using countless gallons of fossil fuels to bring their yummy goodness to your grocery store. Because I live just a few miles from Mexico, I am hoping that I can find a more local source for my very moderate intake of organic coconuts. In the meantime, I am supporting a healthy internal ecosystem by making coconut water kefir and cultured coconut pudding this week. Coconut can be cultured and fermented in many different ways and at different stages of life. Coconut Milk and Coconut Milk Yogurt are made from the familiar hairy, brown, mature coconuts. Coconut water kefir and cultured coconut pudding, however, are made from young coconuts. Instead of appearing hairy and brown, a young coconut, like all things in their youth, is green and smooth. Often the green outer shells are cut off before they are shipped to U.S. markets. Look for either the green shell or a cylindrical white “husk” if the outer shell has been removed. You may not see them in the produce section of your big-chain supermarket, but they are readily available in Asian, Latino, and other ethnic or farmers’ markets. Many health food stores will carry them upon request. 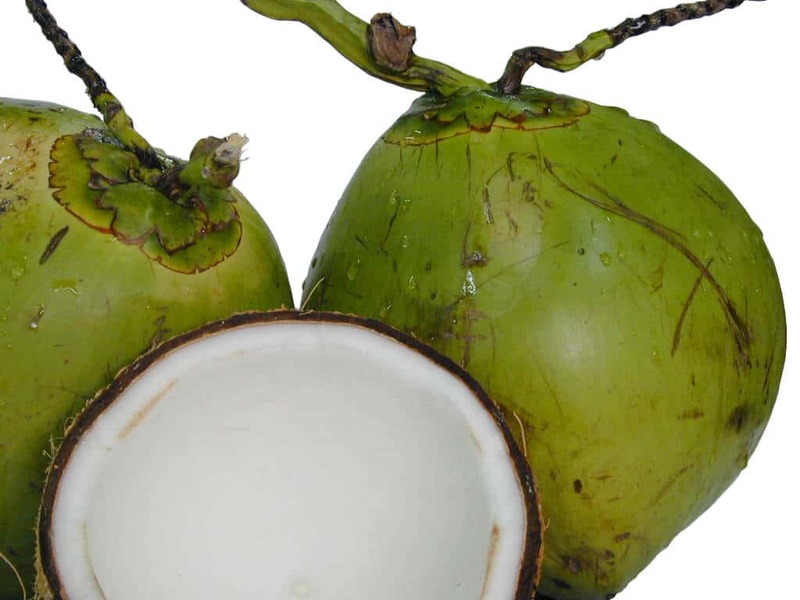 Young coconut water is best fermented by adding either water kefir grains or a prepared kefir powder to it. Kefir (pronounced kuh-FEER) is a unique combination of probiotic bacteria and healthy yeast which consume the sugars in the coconut water, making the drink bubbly and delicious—like soda, but without all the chemicals and sugar. Many people find kefir significantly more effective than probiotic supplements at dealing with digestive issues, candida overgrowth, leaky gut issues and food sensitivities. 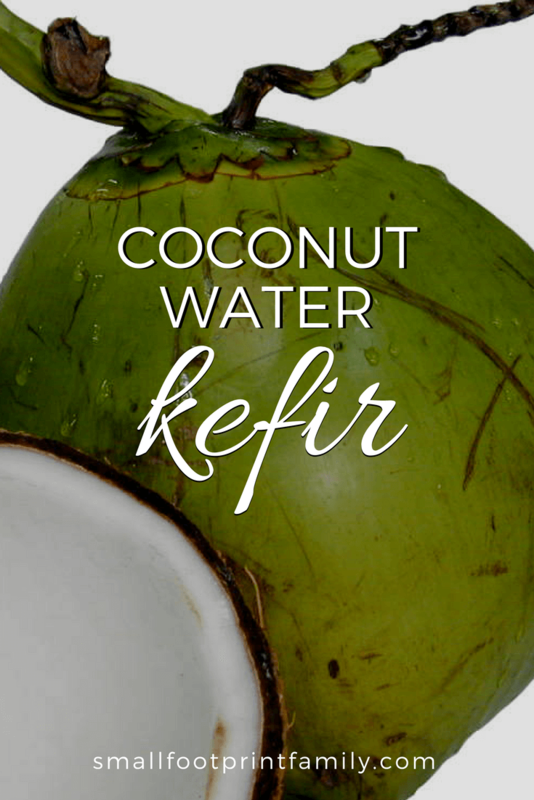 The other benefit to drinking kefir is actually in the coconut water itself. Coconut water is a nutrient-dense beverage filled with minerals, vitamins, antioxidants, amino acids, enzymes, and growth factors, and it also has only a fifth of the sugar found in most fresh fruit juices. Fermenting it reduces the sugar even further and makes all of these nutrients even more available to your body. If you make coconut kefir from powdered kefir packets, you can save a little portion of your batch and then add it to a new jar of coconut kefir. You can keep repeating this process of saving a bit from one batch and adding it to the next until it loses it’s fermenting power. So while the packets are a bit expensive, you can stretch them out over a couple of batches. Coconut water kefir is a bubbly, delicious drink made from probiotic bacteria and healthy yeast that ferment the sugar in the coconut water. Sterilize all your equipment, especially your jars. Conserve the young coconut spoonmeat inside and use for Cultured Coconut Pudding (recipe below), smoothies or desserts. Heat the coconut water to about 90 degrees. Add kefir grains and stir in thoroughly; they won't dissolve. Pour the inoculated water into a sterile jar and either cap loosely or place the airlock lid. Ferment at 72-75 degrees F for 36-48 hours. In the summer, this could mean your countertop. In winter, the top of the fridge. Avoid agitating the jar. The water will get milky white and usually a bit of bubbles will form on top. The taste should be slightly tart and tangy with only a little of the original sweetness. Refrigerate after fermentation. It will continue to ferment, but the process will be much slower. Will last about a week. This procedure can be repeated up to 7 times. Inoculate a new batch within 3 days of removing culture from the previous batch. Stir in crushed fruit if you wish, and enjoy with meals and before bed to restore your digestive health. Use up that young coconut meat with this delicious fermented pudding. Add fresh fruit and you have the perfect summer dessert. Open the young coconuts and conserve most of the the water for Coconut Water Kefir (recipe above). The meat should be white. If it is pink or gray, it should be discarded. Scoop the meat out with a strong spoon or spatula. Rinse any brown skin off the meat. Put the coconut meat in a blender and purée with just enough water to create a pudding-like consistency. Add a teaspoon of kefir grains. Pulse to incorporate. Transfer the pudding to a glass or ceramic container, making sure there are a few inches of room on the top for the pudding to expand. Cover the container and let it ferment on your countertop or on top of your fridge at about 72-75 degrees for 7-10 hours. After fermentation, add cardamom or cinnamon and nutmeg and stir in. Refrigerate. It will last about 3 days. Enjoy for dessert with fresh strawberries or other toppings. Hi there, would I be able to use coconut meat from a brown coconut? I have all this coconut meat and was thinking of simply putting chunks of it in my first water kefir ferment or blending it to make a coconut milk &I then making coconut pudding out of it. What do you think? Is he coconut meat from an older coconut just fine? Thanks! This recipe was made for green coconuts. You can try it with ripe coconuts, but I do not think it would be the same. So glad you are enjoying the recipes! The pudding isn’t fermented using the same bacteria or the same temperature as the yogurt, which makes a difference. Also you need to use kefir grains for the pudding, not probiotics. However, if you are using coconut meat as a thickener in the yogurt, then you would heat it with the milk. 1) Do you really need water kefir grains for the pudding or can you use a little of the coconut water kefir previously made? Just wondering. 2) Will the pudding rise a lot? Thanks for addressing these questions. It would be best to use the grains or powder to avoid watering your pudding down, though give it a try using the kefir itself. It rises a little bit. I’ve been trying to make coconut water kefir and I’m not sure I’m doing it right…. my kefir grains died after a few batches and I’m not sure why! I first made a batch with filtered water and coconut sugar then drained the grains out and put them in coconut water and then repeated that same process. I was told that the grains need to be fed in between batches of coconut water by adding the sugar. I let it ferment between batches. Any thoughts? Also, I would like to understand why I need to heat the coconut water first? I’ve never done that…. I heat the fresh coconut water first to make sure any pathogens are killed. This isn’t necessary if you are using coconut water from an aseptic can or box. Water kefir grains are finicky and need to be kept alive with sugar water, however you might need to use regular cane sugar instead of coconut sugar to keep them healthy. Try this page of resources for additional troubleshooting assistance. I’ve never been able to acquire a taste for coconut, honestly I dislike it. However, I recognize the health benefits and want to find a way to incorporate it into my diet. Given my leaky gut issues, cultured coconut water seems like a good idea. Would you recommend it for someone who can’t stand the taste of coconut? Probably not the best choice for you. You might want to try one of the many other fermented foods for gut health, like kefir, sauerkraut, beet kvass, kombucha, dairy yogurt, water kefir, etc. I made a batch of coconut water kefir. I took out the grains and they have been in a jar in the refrigerator for at least a week…..Are they still usable? Most likely. It’s best to simply take them out and use them to make a new batch, and so on and so on, perpetually… If you carefully rinse them (DON’T use chlorinated water! ), and pat them dry, they can be stored in a jar in the fridge for up to 3 weeks. I cannot WAIT to try this recipe for non-dairy kefir/yogurt. I’ve been dairy free for the last few months and have sorely missed getting my probiotics from food sources, rather than a capsule. Thank you for posting! You’re welcome! You can also culture coconut milk from mature brown coconuts into yogurt as well, which is cheaper but a bit more involved. Here’s the recipe. I’ve never seen young coconuts being sold, so I dont think I’ll be able to try out this recipe… But it looks great! What does the fermented coconut pudding taste like? Yogurt like? Is it sweet at all? You can make coconut water kefir from packaged coconut water, but the pudding definitely requires the whole coconut. Cultured coconut pudding is slightly sweet, but more like yogurt. How informative. Thanks for sharing! Love, love, love this post! I have a love/love/love relationship with coconut 🙂 But you’re right, the ecological footprint is definitely something to think about :-/ It’s such a wonder food, but we really do have to think about what that means for the ecosystems that are affected during it’s growth and harvest. Thanks for the insightful post and the useful recipes! I’m pinning this to my coconut board on Pinterest. Thanks for sharing at Tiny Tip Tuesday! Such an interesting post! I am only just beginning to discover the health benefits of coconut. Your pudding sounds delicious as well as nutritious! Your pudding looks delicious, we would just love it. Hope you are having a great week and thank you so much for sharing with Full Plate Thursday. I truly enjoy all the wonderful information that you share on your site regarding coconuts. I started my daughter drinking coconut water about 2 years ago. She loves it! We haven’t tried coconut pudding as of yet, but will give it a shot. Thank you for sharing this week in our hop ? I see that I have to come back and read a lot more, from your blog, which has so much value. Thanks for sharing this with us. This pudding sounds amazing!! Gonna have to try that for sure! My son and I love coconut water kefir ! I always have a batch going on my counter at all times, we just cannot get enough of it. I use pre-packaged coconut water and find that it works just as well and is so much less time consuming. I recently read a book called “Ecological Intelligence” by Daniel Goleman. I learned a lot about footprint that I never knew. For instance, I had no idea that the red bell peppers shipped from Holland had a smaller carbon footprint than the ones trucked in from California (I live close to the east coast.) Although both are organically grown and neither have the nutrient profile or local-friendliness of bell peppers grown in my own state, it was an interesting concept to me and took me by surprise. There’s more to “footprint” than I ever suspected. That’s a great book! I like other books by Daniel Goleman too. Indeed, so many things have global reach these days that “footprint” can get complex. There’s so much to sort out that I like to keep it simple by eating local, in season, organic and homemade as much as possible.